today presented a quintessential example of just how removed we architecture students can be from life in the mit community. four of us were eating lunch in front of the student center and noticed the unusual bustle around campus. what was going on? why were throngs of people lined up by a large tent outside of kresge auditorium? and why did we see groups of women wearing some sort of ethnic dress? the answer? 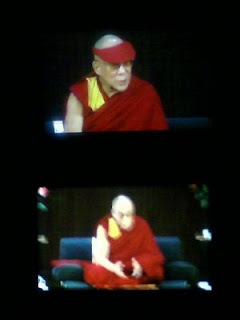 the dalai lama was on campus. !!! how did we not know?? apparently mit just established the dalai lama center for ethics and transformative values, and he was here for the dedication. it's sad this news almost sailed right over our studio bubble. one of our instructors even wondered why we were sitting around working rather than heading over to the lecture, and this was one of the first times she has ever encouraged us to do something other than studio. we weren't able to pry everyone away from their desks, but some of us went to one of the overflow rooms to see his holiness via video projection. you needed tickets, distributed by lottery, to get into kresge to watch it live, but the screen was as good as anything to hear a bit from the 14th dalai lama. his talk was mostly about the importance of establishing secular ethics, outside of religion, in practicing leadership and compassion in today's world. from his stance, since much of the world are "non-believers" (his word), then it's necessary to find a non-religious way to promote ethics and values. i'm not sure what he was giving as a basis for these ethics and values (still vague), but it seems like he wants to promote this compassion-centered model for leadership in the future, and a place like mit would allow for education, science, and ethics to come together. how will buddhist beliefs and the scientific method exist together? i guess we'll see? in general, the speech was of the visionary and uplifting type, sprinkled with jokes, youthful laughter, and the occasional pointed barb (mostly aimed at the chinese government). i was surprised that he had such a lighthearted and humorous demeanor. every time he laughed, we looked at each other and couldn't help but laugh along, sort of like when a grandfather - or baby - starts chortling. oh, and in the middle of the speech, he took out a red visor and put it on (top photo). somehow that reminded me of those chinese tour groups, when they all wear matching visors/hats and follow the guide holding a flag. and at the end of the q+a session, when the last woman was asking her question, he started slowly pulling up his socks and putting on his shoes. maybe it might be sacreligious for me to say this, but those little gestures made me smile and think what a cute old man he is - in the most respectful way, of course. anyways, i've been curious about the dalai lama, since he's one of the few religious leaders who has been so widely and favorable regarded by much of the world. some of his appeal seems to transcend his role as a buddhist leader, instead focusing on his role as an advocator for peace. one of my friends and i talked a bit about whether the pope or another religious leader would get the same all-embracing reception that the dalai lama did. i'm actually not so sure. i can't quite explain the dalai lama's widespread appeal, although when seeing him i did find him to be an engaging and endearing character. i don't agree with everything he talked about, since i find it hard to separate ethics from its source in faith (then what becomes the standard? our flawed selves? ), but he has done very much in promoting peace and general positive values, and at least i can agree with that. skimming of summer: the start!